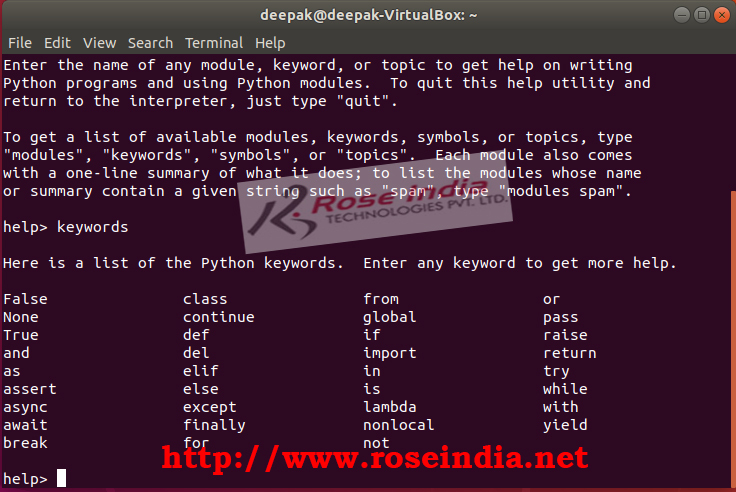 This tutorial has been written with the objective of teaching the basic concepts like keywords, variables and comments in Python programming language. 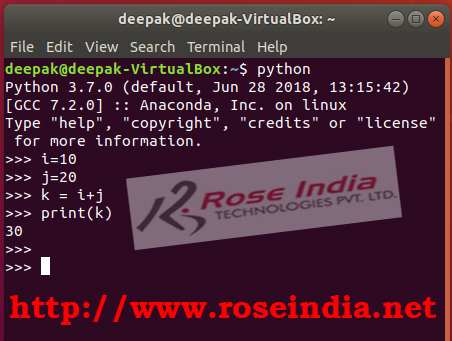 Python has been one of the oldest and most used programming languages; it comes with many libraries and modules to develop many types of applications. Python is also very extensively used in machine learning, artificial intelligence and deep learning field. Today we are going to learn keywords, variables, identifiers and comments in Python programming language. These topics are important basic concepts of Python and developer must learn these concepts in Python Programming Language. In Python keywords, identifiers, variables and comments are considered as building blocks of programming language. In this page we will see all these topics of Python with examples. Like other programming languages Python also comes with the reserved keywords with special meaning and these can't be used to define variables, function and other objects in Python programming language. The reserved words are collectively known as Python keywords. print: The print is function in Python3 and it is used to print data on the console. while: The while keyword is used for controlling the flow of the program on certain condition. for: The for is used for looping in Python and it can also used for iterating the items in the collection. break: The break keyword is used for coming out (interrupting) the execution of current loop. continue: The continue keyword is used to interrupt current cycle and jump to to another place in the program. Here new cycle begins with the use of continue statement. if: The if statement is Python is used for run the code conditionally if the condition is satisfied by the if statement. is: This is used to testing the object identity. or: It is used for matching at least one condition out of all the conditions. import: The import statement is used to import and use other modules into a Python script. as: This is used to give a module a different alias. from: This is used for importing a specific variable, class or a function from a module in Pyton application. def: The def keyword is used to create a new user defined function. You can use this keyword to make your own user defined function in Python program. return: This keyword is used to exit the function and returns a value to the calling function. lambda: The keyword is used to create a new anonymous function. try: This is use for exception handling in Python. finally: This keyword is used with the try and catch block in Python, The finally block is always executed in the end. In this block resource cleanup is done. raise: The raise is used to create a user defined exception in Python. del: The del keyword is used to delete the object in Python program. class: The class keyword is used to create new user defined objects. exec: The exec keyword is used to execute Python code dynamically. In the above code we are defining a variable with the identifier "name" and it is holding data "Deepak Kumar". 1. You can make identifiers with a sequence of letters (a-z or A-Z) and it can be mixed with digits or and underscore. 2. There must not be any space in the identifier name. 3. It must not start with digits but can end with a digit. For example 1name is invalid while name1 is valid identifier. 4. Reserved keywords can't be used as identifier. Variables are label given to in-memory object and it only exists during the execution of program. You can use variables to store data in the memory during the program execution. For example in the above code we have declared two variables i and j, then added these two variables and stored the value in k variable. Finally printed the value of k on the console. Code commenting is very important in programming and it is must to properly comment your code. Code commenting is considered as one of the best practices in software development. 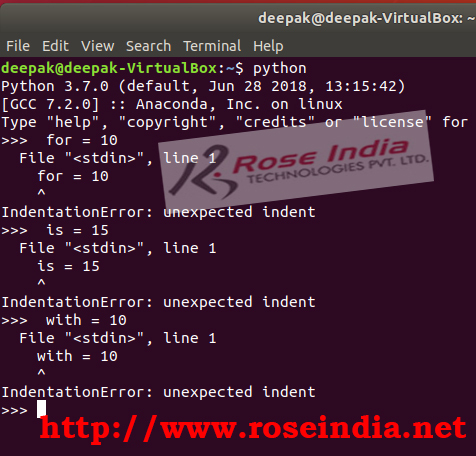 In this tutorial we have learned about the Python keywords, variables, identifiers and comments.